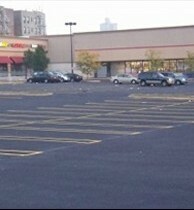 The most important preventative maintenance step you can do for your parking lot is crack filling. New York Sealcoating keeps your pavement healthy by sealing up all your cracks in no time, by using state-of-the-art equipment to install hot applied joint sealants that meet or exceed FAA, ASTM, and MHD standards. If left unattended, open cracks begin to compromise the quality of your pavement surface, and will eventually result in costly repair or replacement services. Additionally, this may also increase your chance of liability issues. Let us help you avoid all of this. Extend your pavement's life through an asphalt crack repair maintenance program that prevents water penetration into the subbase by applying a hot fiber-reinforced rubberized asphalt crack filler. Our crack filling service in Yorktown Heights, NY, also eliminates any potential liabilities. Contact us in Yorktown Heights, New York, to request an estimate for our pavement maintenance services, and let us fill your cracks today.